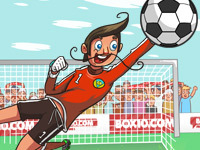 Try to save as many shots as you can with the funny ragdoll goalkeeper! Can you win the football game? Go for a top score! Click and drag the goalkeeper, release the mouse button to throw him.